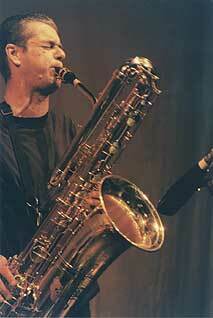 Born in Aylesbury, Bucks on 9th June 1956; bass, tenor & soprano saxophones. After studying classical flute at secondary school, at the age of sixteen Tony Bevan began playing the soprano saxophone, inspired by the dislocated rhythms of Captain Beefheart and the endless repetitions of Terry Riley (for good or ill, influences that have stayed with him to this day), and encouraged by Aylesbury town boy Lol Coxhill, who was kind enough to give him his first soprano lesson and point him in roughly the right direction . A year later he bought a tenor saxophone, and quickly added Sonny Rollins, Ornette Coleman and Warne Marsh to his list of influences. Around this time he also discovered the music of Derek Bailey, Evan Parker and Han Bennink via Topography of the Lungs and was drawn haplessly into the world of Improvised music. After attaining a degree in Philosophy at Southampton University, Bevan returned to Aylesbury and began attending the Monday night Open sessions at the then Gloucester Avenue based London Musicians Collective, where he encountered (and sometimes played with) the 'Second Generation' of British improvisers, such as Steve Beresford, Dave Solomon, John Russell and Nigel Coombes. Later he became involved with the rather more local Oxford Improvisers Collective, and performed with Oxford-based musicians such as Pete MacPhail and George Haslam (in The Four Corners saxophone group), Tony Moore, and Pat Thomas, with whom he played a fledgling Avant-Funk in the quartet M4. It was with an Oxford-based trio completed by Tasmanian guitarist Greg Kingston and percussionist Matt Lewis that he first appeared with Derek Bailey's Company (in 1988), and released his first CD on Bailey's Incus label. A further record on Incus, the Mercury Music Prize-nominated Bigshots with bassist Paul Rogers and percussionist Steve Noble was released in 1992. In the spring and autumn of 1994 Bevan toured Britain as part of a trio with Steve Noble and singer Phil Minton, having recently added the bass saxophone to his instruments. A further recording with Noble, plus German Double-bass player Alexander Frangenheim was released in the autumn of 1996. Bevan has appeared with the thrash/funk band Noyz'r'us and on a number of cartoon film soundtracks for the composer Steve Beresford. A record of his solo Bass saxophone playing has been released, containing material recorded on a solo tour of England and Scotland in July 1998. He undertook a further solo tour of Scandinavia, playing Copenhagen and Stockholm in August of 1999, and toured America in May 2000. His current groups include trios with Stefan Jawarzyn and Mark Sanders, a saxophone quartet with Jon Lloyd, Pete MacPhail and Tom Chant, and occasional duos with Adam Bohman and Derek Bailey. He runs the Foghorn label. 1988,	Original Gravity,	Incus CD 03. With Matt Lewis and Greg Kingston. 1991,	Bigshots,	Incus CD 08. Tony Bevan/Paul Rogers/Steve Noble. 1990-1993,	Cue sheets,	Tzadik 7501. Steve Beresford. 1994,	Pucker Up,	TJOPS. Noyz'r'us. 1994,	Snorkle,	TJOPS. The Resignation Orchestra. 1995,	Twisters,	Scatter 06. Tony Bevan/Alexander Frangenheim/Steve Noble. 1998,	Three oranges,	Foghorn Records FOGCD001. Solo. 1999,	Visitors book,	Incus CD-R. Tony Bevan/Derek Bailey duo on compilation CD. 2000,	Nothing is permanent but woe,	Foghorn Records FOGCD002. Bevan/Edwards/Sanders. 2000,	The sale of tickets for money was abolished,	Balance Point Acoustics BPA 002. Bevan/Smith/Looney. 2001,	Nham,	Foghorn Records FOGCD03. Bevan/Bishop/Zerang/Edwards. 2002,	Limescale,	Incus CD 56. 2002,	Under Tracey's bed, Foghorn FOGCD-R02. Bailey/Bevan. 2003,	Home cooking in the UK, Foghorn FOGCD004. Sunny Murray/John Edwards/Tony Bevan. 2003,	Good cop bad cop,	No-Fi NEU011. Derek Bailey/Tony Bevan/Paul Hession/Otomo Yoshihide. 2004,	Bruised, Foghorn FOGCD005. Tony Bevan/Orphy Robinson/John Edwards/Ashley Wales/Mark Sanders. 2004,	Bruise with Derek Bailey, Foghorn FOGCD006. Derek Bailey/Tony Bevan/Orphy Robinson/John Edwards/Ashley Wales/Mark Sanders. 2005,	We packed are bags, Foghorn FOGCD008. Bruise. 2006,	The gearbox explodes!, Foghorn FGCD009. Sunny Murray Trio. 2009,	Boom boom cat, Foghorn FGCD011. Sunny Murray/John Edwards/Tony Bevan. 2009,	A big hand, Foghorn FGCD012. Tony Bevan/Paul Obermayer/Phil Marks/Dominic Lash. 2010,	I stepped onto a bee, Foghorn FGCD014. Sunny Murray/John Edwards/Tony Bevan. 2010,	Everybody else but me, Foghorn FGCD015. Tony Bevan/Matthew Bourne/Tony Buck/Barre Phillips.